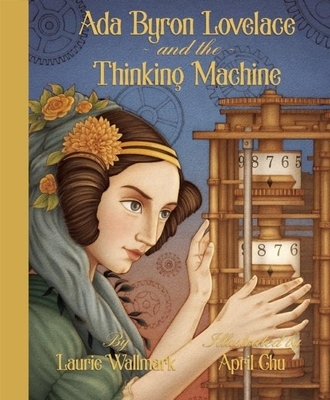 My Brain on Books: Guest Post from Laurie Wallmark for ADA BYRON LOVELACE AND THE THINKING MACHINE ... plus a Giveaway! Congrats to Laurie on her new book. Picture books in general are hard to write and must be even more challenging when writing a biography. But such a great way to start getting kids into reading about people's lives. I'm going to let someone who reads picture books win this. Picture books are definitely hard to write, Natalie! But Laurie did a fantastic job. I must read this book! It looks way cool - plus, in our neck of the woods, ADA is Famous! She is amazing. And I'm so glad there's a new picture book Bio about her. How cool that Ada is famous in your area, Sue! This looks wonderful. The pictures you shared are magical. Good luck with this one but since I typically deal with MG, I will pass on the drawing. I was happy Laurie shared those double-page spreads with us, Greg. It really gives you a feel for the entire book. Whittle things down and focus on a single idea. Makes sense. This was a amazing post. I've never given much thought about PB biographies, but that's because I've never considered writing one. You've surely opened my eyes to their fascination. So much thought and planning has to go into these. Well done! IT was great meeting you, Laurie. Best of luck with this! I loved hearing about Laurie's process, and will definitely keep my eyes out for this. I saw your tweet! Thanks. Extra chance duly noted. And that's great that your local museum had an exhibit about Ada. Hi Everyone, Thanks. Picture books are definitely challenging, but fun. Sue, I don't know where you live, but Seattle has a bookstore, Ada's Technical Books. Thanks so much for stopping by, Laurie. What a lovely story, and so fun to hear about it's creation! Congrats to Laurie and best of luck with the blog tour! I'll look for this picture book. Don't enter me in the draw though; I'm in Canada and the silly border gets in the way of getting free books! That's a shame about the difficulty of getting books through the border, Kim. I hope you can find Laurie's book there. And thanks for telling us about that graphic novel. Thanks so much for your tweet, Rosi! Extra chance duly noted. 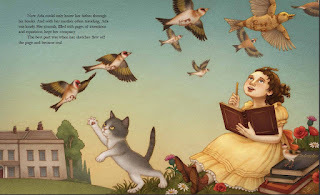 Picture book biographies are such a great way to introduce to kids to history. This one sounds fascinating! Please don't include me in the draw, as I live in Canada. Sorry, Andrea. I wish there was a way to include Canadian readers. But thanks for stopping by. Oh, this sounds wonderful! My husband is a software engineer and this would be so great to get for the kiddos (and me, for that matter)! This sounds perfect for your family, Jess! I didn't know Stephanie taught coding and programming, Jess. Yes, Laurie's book is timely. I've noted your extra chances. Thanks so much for spreading the word! Thanks for stopping by, Claudine. Looks interesting. Having it sent over from public library. I was hoping that my middle school students could be tempted by these picture book biographies, but so far they aren't picking them up. Drat. Yes, I could see that as a problem. If it has pictures, they probably think it's too young for them. But they could learn a lot from this!